Sometimes, the kitchen is too small to prep a multi-course meal for friends or family. If only you had 12 square inches more counter space to chop vegetables, or an extra shelf to move the unused toaster out of the way… Sound familiar? Then this tutorial is for you! Without breaking your budget, you can create a kitchen island that goes above and beyond your wildest culinary workspace and storage dreams. Just follow these plans for how to build a kitchen island with room to do it all—chop, mix, shelve, store, and more. Ours measures 57 inches long, 21 inches deep, and a standard 35-½ inches high, but, of course, you can alter these dimensions as you see fit to better address your kitchen’s needs. 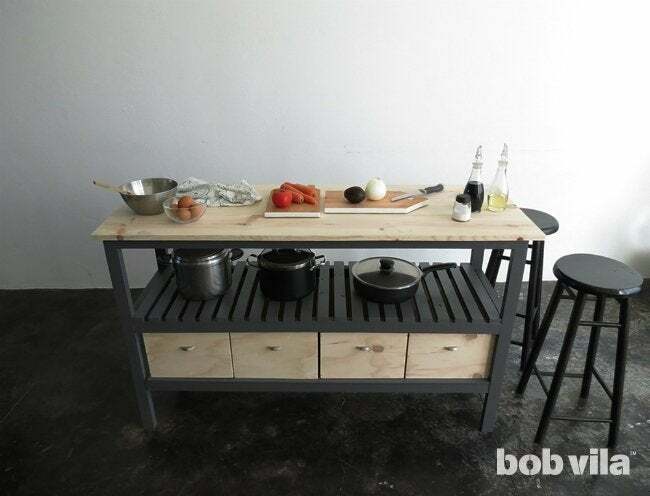 Sand all edges of your cuts, and assemble one side of the kitchen island by arranging a 57-inch 2×2 with two 33-inch legs to make a U-shape as pictured. 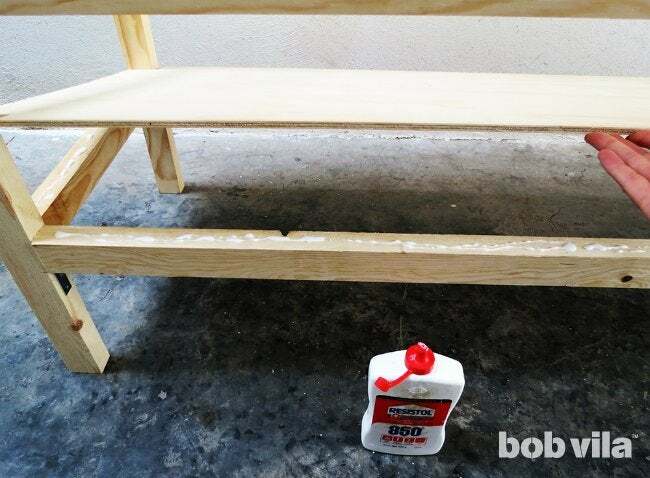 Glue the two legs to the bottom of what will be the countertop support, then pre-drill holes for and fasten with two screws through the top at each end. Place two 54-inch shelf supports between the island’s legs (the first 12 inches from the bottom of the island’s top, and the second 10 inches beneath that). Affix with a dab of wood glue on both ends of the 54-inch shelf supports, and reinforce with a 2-inch metal corner brace beneath each end. Repeat Steps 1 and 2 to make a second identical structure. Join the two identical halves using the six 18-inch pieces. 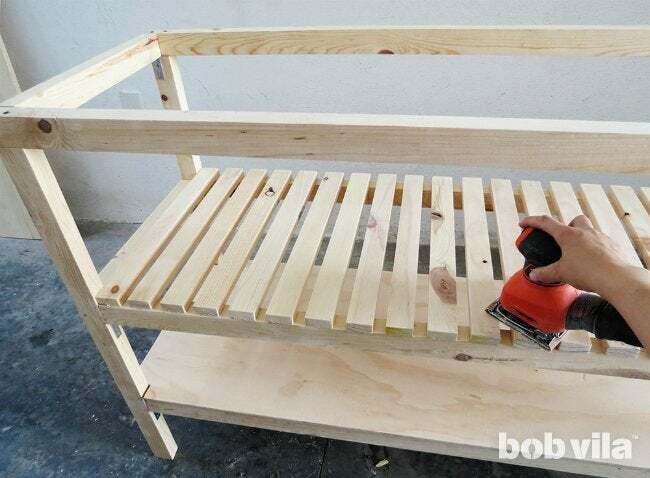 To accomplish this, place half of the frame on the floor and affix three 18-inch lengths to each leg using wood glue. Note: Each 18-inch 2×2 should align with the horizontal 2×2s already connected (the shelf and countertop supports). Screw corner braces beneath each connection for extra support. 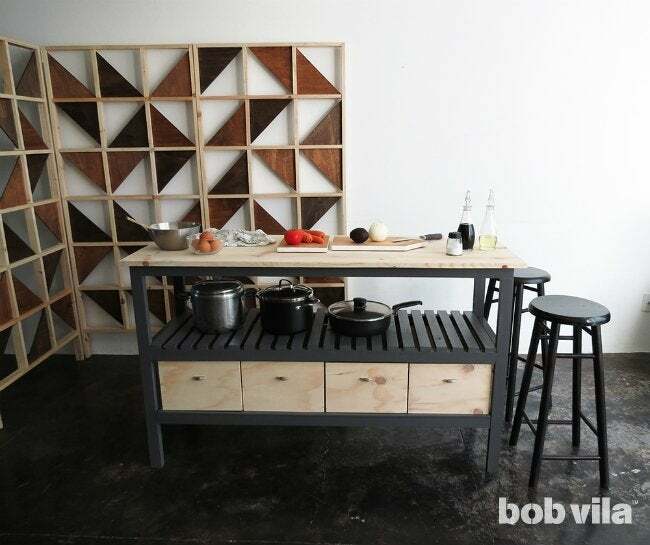 Lay the second half of the DIY kitchen island’s frame (without the attached 18-inch cuts) flat on the floor. 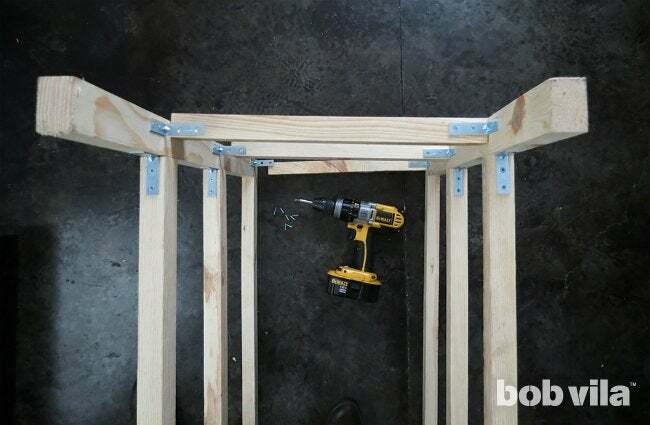 To prepare to connect both halves, you’ll want to screw three metal corner braces to each leg, one at each level. 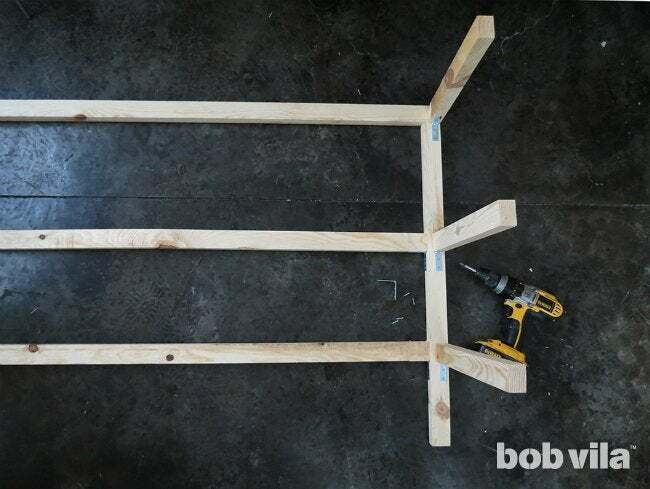 Scoot each corner brace to the edge of the leg so that it’s perpendicular but perfectly aligned with the corner brace already in place supporting either a shelf or countertop, then screw each into the wood. Lay the two halves in front of each other, corner braces and 18-inch supports facing in and feet facing up. 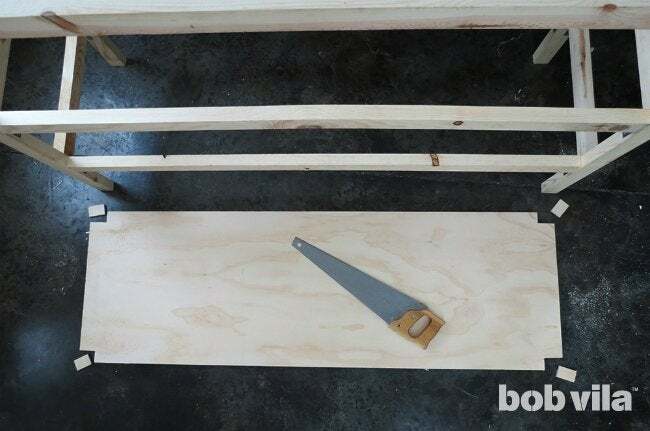 Apply wood glue to the exposed ends of the 18-inch supports, press them to the opposing kitchen island legs, and screw the second half of each corner brace into the wood supports. 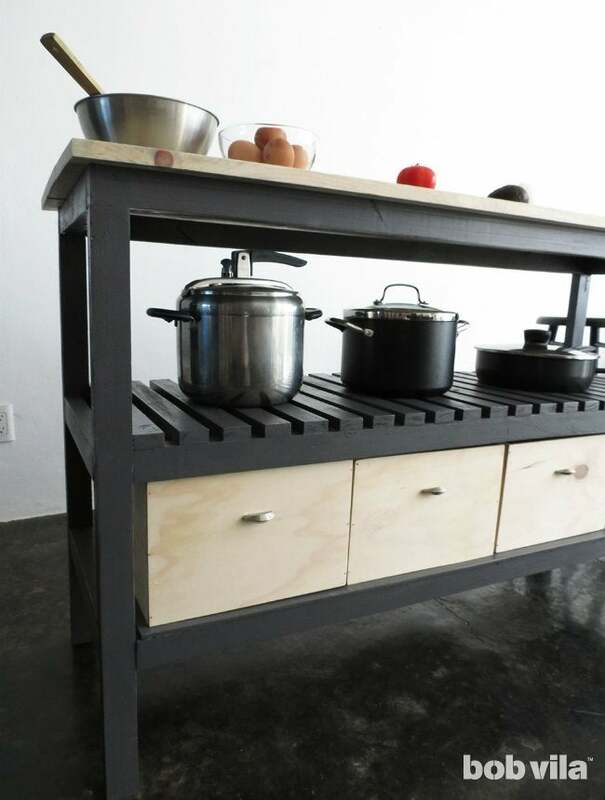 Stand your DIY kitchen island upright. 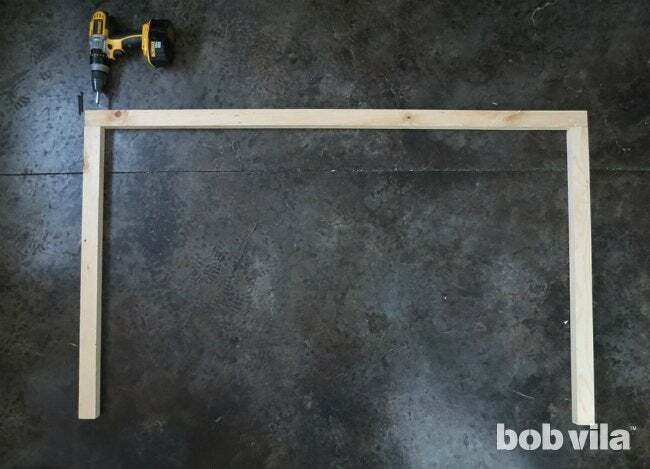 Cut a rectangle of 57 inches by 21 inches from the 6mm plywood sheet in order to make the lowest shelf. At each corner, cut out a small notch the same dimensions as the legs (1-½ inch square). Sand the plywood, especially the cut edges. 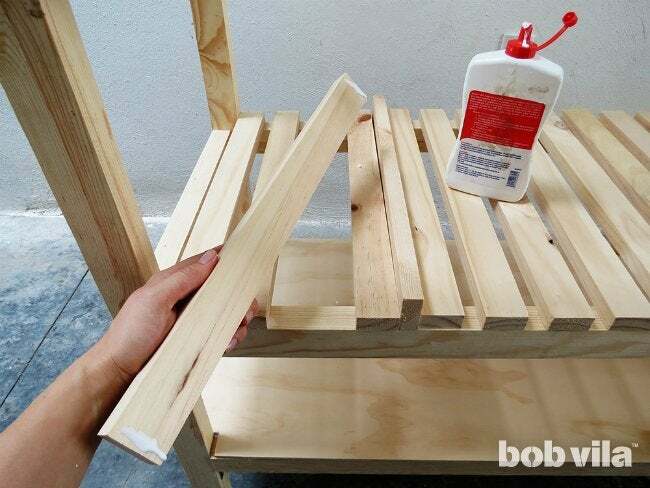 Apply wood glue to the tops of the lowest level of 2×2s and fit the plywood piece through the open top of your DIY kitchen island into place onto the adhesive. Press the wood pieces together with clamps until the glue dries. 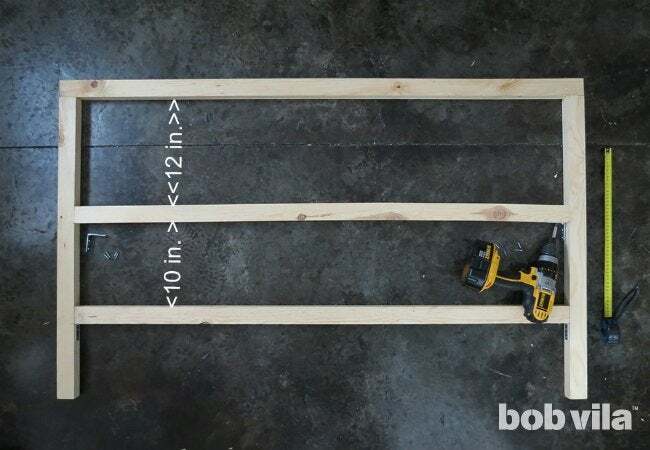 Make the second shelf using 1×2 lumber cut into 22 21-inch lengths. Lay them out over the structure’s middle-tier supports, leaving a ¾-inch gap between each, and glue down the 1×2s at each end. Sand all parts of the kitchen island, first using 80-grit sandpaper on a palm sander, then again with 120-grit for a smooth finish. Wipe down all the dust with a clean rag before you move on to apply two coats of acrylic paint. 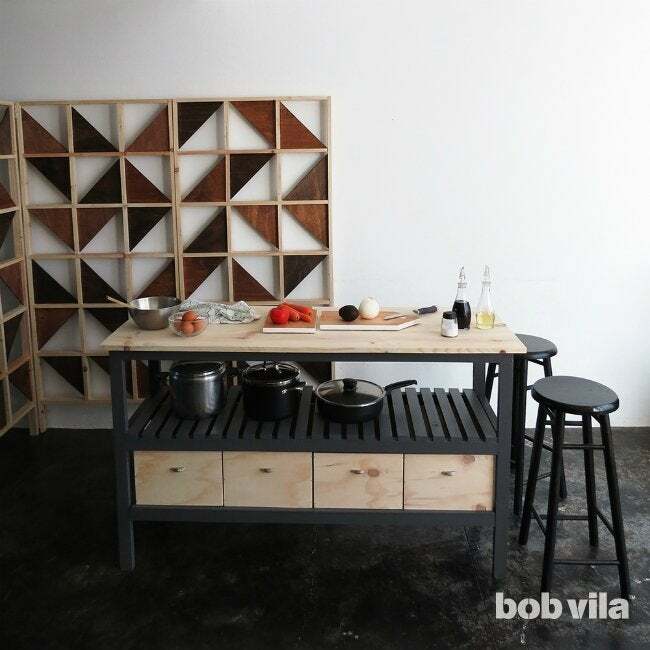 We chose a charcoal color, but you could stain and varnish it instead, if you prefer. 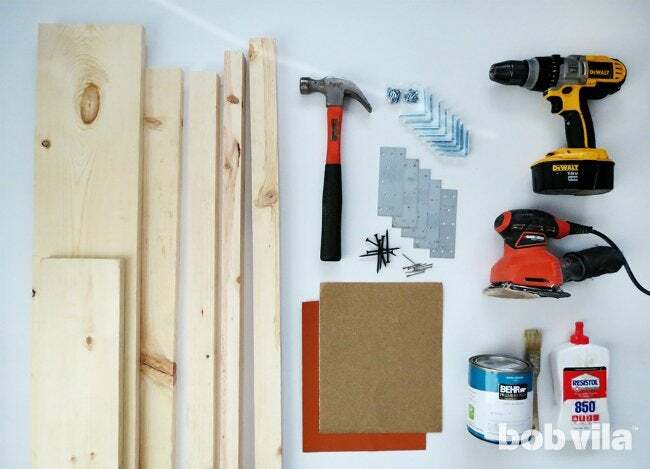 While the paint (or stain) dries, you can build the countertop using the 2×8 lumber. Cut the 10-foot planks into three 5-foot-long pieces to make a countertop that is a little longer and wider than the base of your DIY kitchen island. 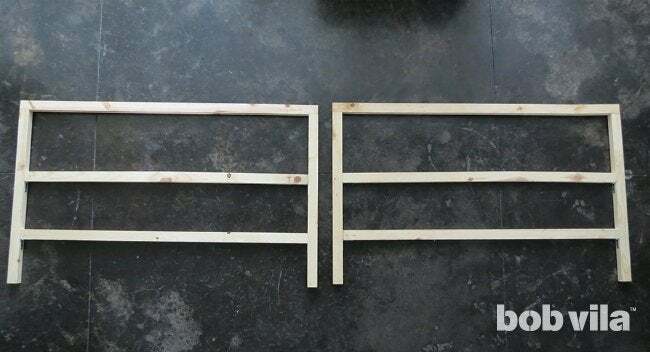 Carefully align the pieces side by side so that no one extends past the others, then apply wood glue along the 1-½-inch side of each where they meet. As the glue dries, screw three 4-inch mending plates along each seam on the back. 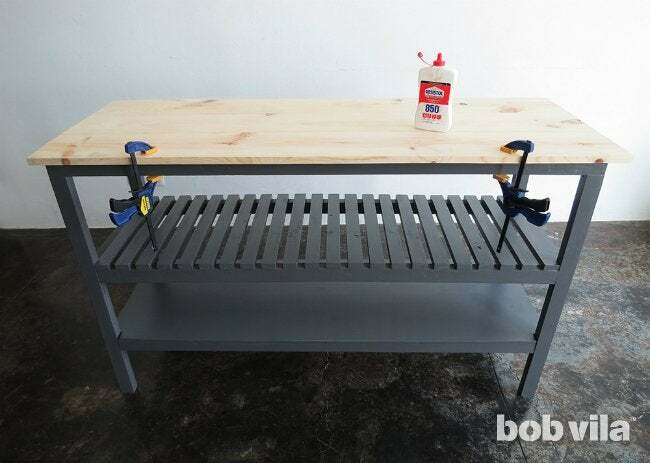 Sand the completed countertop down, and protect it with a coat of varnish or mineral oil. Once the varnish is dry, lay the countertop on your kitchen island; it should hang ¾ of an inch off the front and back and 1-½ inches off the left and right sides. Center it as best you can, then glue and clamp the countertop onto the structure while the adhesive dries. Sure, you can purchase storage boxes or crates from your nearest home goods store or craft center—or you can build a set to perfectly fit the allotted space on the lower shelf for less money than you’d spend otherwise. We made four boxes of 13 inches wide, 8-½ inches tall, and 18 inches deep with a quarter-sheet of plywood. 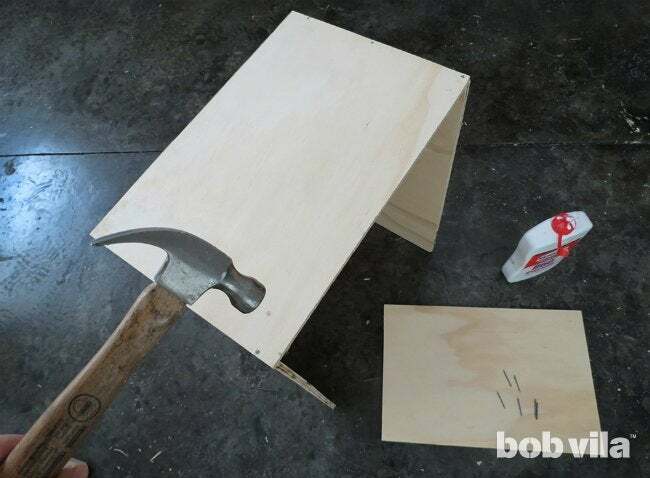 To assemble the box, apply wood glue along the edges of the box bottom (the 12-½-by-18-inch rectangle). 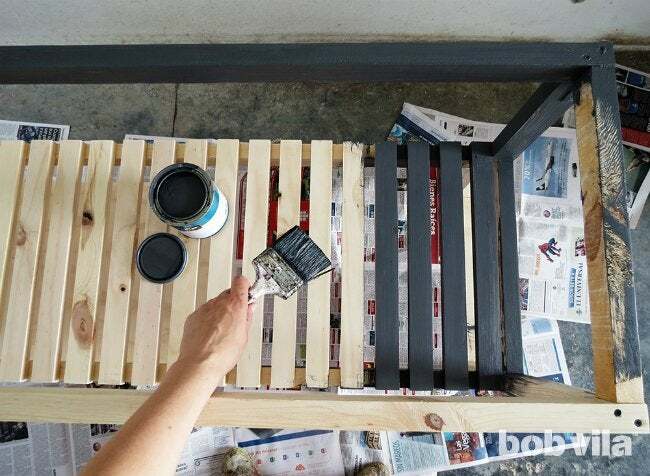 Lay it flat and on the ground and press the front and back panels (the 8-½-by-13-inch rectangles) in place, then apply glue to the exposed edges of the front and back panels—except for the tops!—and slide the sides (the remaining 8-½-by-17-½-inch rectangles) into place. Essentially, all sides should wrap the bottom of the box, and the front and back should cover the edges of the sides. Reinforce the construction with ½-inch nails; hammer three along each side of the front and back. Repeat to make four boxes total. Once the wood glue has dried, add a metal drawer pull for easy opening and closing of each new “drawer” on your DIY kitchen island. 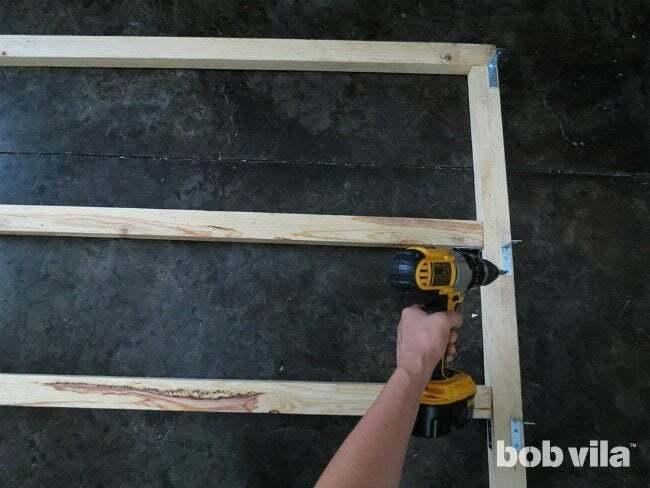 As we used only 6mm plywood to build these, you may have to glue an extra piece of scrap wood on the inside directly behind where you want to add the pull so that there’s enough thickness to drill screws into for the drawer pull. 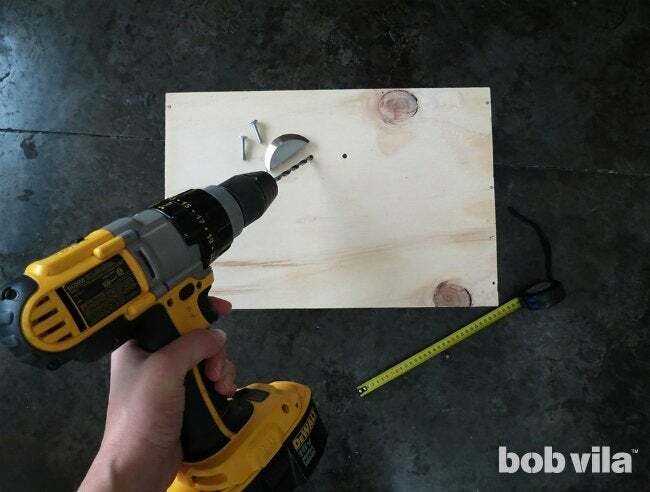 Measure to find the center near the top of the box’s front, place your drawer pull 2 or 3 inches from the top; when happy with the position, mark and drill holes. Screw this drawer pull into place, and repeat on the remaining three boxes. Once you’ve shelved these boxes to the lower shelf as drawers, and ready to enjoy your new DIY kitchen island.